We thought we’d heard the last of Jesse James. The custom bike builder (or more cynically, overpriced T-shirt seller) has kept a pretty low profile since his reality TV show ended and his marriage to Sandra Bullock went down the tubes. Last we heard, James was building hot rods in Texas. Apparently that’s not paying the bills, though, As a result, James has had to pick up a second job. Now, he’s customizing firearms; according to the website for this business venture, his goal is “to deliver the most reliable, accurate, and durable firearms you can buy.” Sorry, James, but we just can’t see you becoming the next John Moses Browning. If they opened Maple Leafs games like this, it might actually be worthwhile going. Either that, or they bring back Gary Roberts. Be the coolest motorcyclist at Comiccon. You see them all the time, on YouTube – customized motorcycle helmets that leave cagers under the impression that Cookie Monster is riding alongside them. What’s the most famous helmet to come out in the past couple decades? 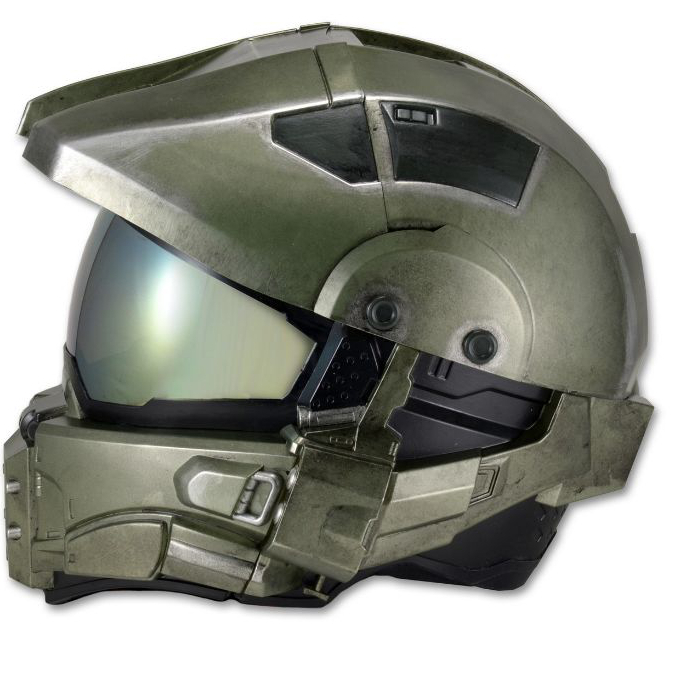 Probably the headgear worn by the Master Chief, the faceless hero of the Halo series of XBox games. And in a world where Honda has built a motorcycle aimed at anime fans and you can buy Batman lookalike leathers, we’re also getting a motorcycle helmet that follows the lines of the Master Chief’s helmet, thanks to costume manufacturer NECO. Surprisingly, it seems the helmet will be DOT-approved, and it’s a modular, so despite what are likely pitiful aerodynamics, it has some utility. It’s just the thing if you’re planning a tour to Comiccon. Speaking of comics – it seems this motorcyclist was more than a little influenced by reading about Bruce Wayne’s Batcave. Hey, it’s a motorcycle storage idea that actually makes sense, as long as you don’t live in an area that floods! If Neco builds a Joey Dunlop Tribute Helmet …. Would they have to pay royalties to Pac Man ? I though I lost a day when I saw this article. Isn’t today Thursday? Or is the Calendar different on the east coast? If CMG can convince my boss that today’s Friday, I’ll take it! Just take it when you can get it, fellows.